The Department of History’s 17th Annual Edmund J. Fusco, Sr. Distinguished Lecture in History will be given Thursday, September 17th by Professor Kenneth Pomeranz of the University of Chicago. 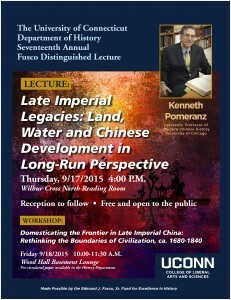 Please join us in the Wilbur Cross North Reading Room on 9/17 beginning at 4:00 PM for Prof. Pomeranz’s lecture: “Late Imperial Legacies: Land, Water, and Chinese Development in Long-Run Perspective.” The lecture is free and open to the public, with a reception and light refreshments to follow. On 9/18 beginning at 10:00 AM, Prof. Pomeranz will give a morning workshop on a pre-circulated paper: “Domesticating the Frontier in Late Imperial China: Rethinking the Boundaries of Civilization, ca. 1680-1840.” Lunch will follow the paper and discussion. About the speaker: Kenneth Pomeranz is a University Professor of History and in the College; he previously taught at the University of California, Irvine. His work focuses mostly on China, though he is also very interested in comparative and world history. Most of his research is in social, economic, and environmental history, though he has also worked on state formation, imperialism, religion, gender, and other topics. His publications include The Great Divergence: China, Europe, and the Making of the Modern World Economy (2000), which won the John K. Fairbank Prize from the AHA, and shared the World History Association book prize; The Making of a Hinterland: State, Society and Economy in Inland North China, 1853‑1937 (1993), which also won the Fairbank Prize; The World that Trade Created (with Steven Topik, first edition 1999, 3rd edition 2012), and a collection of his essays, recently published in France. He has also edited or co-edited five books, and was one of the founding editors of the Journal of Global History. 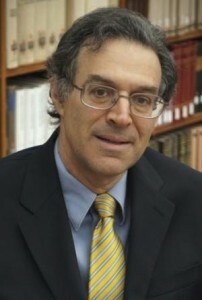 He is a fellow of the American Academy of Arts and Sciences and has received fellowships from the Guggenheim Foundation, the American Philosophical Society, American Council of Learned Societies, the Institute for Advanced Studies, the National Endowment for the Humanities, and other sources. His current projects include a history of Chinese political economy from the seventeenth century to the present, and a book called Why Is China So Big? which tries to explain, from various perspectives, how and why contemporary China’s huge land mass and population have wound up forming a single political unit.